I love looking at pet furniture trying to figure out what I like and what would look good in my house. Unfortunately, it tends to be out of my price range so the pet furniture here is pretty minimal. So I love when I find something like this Dog Bed made from a chair. Gail from My Repurposed Life loves to turn trash into treasure and made this for her Grand-dog Louie to enjoy. She was kind enough to answer a few questions about it. What was Louie’s first impression of his new place? Louie’s first impression was “who ya kidding”? However he warmed up to it in no time, because his mama (my daughter Jamie) didn’t allow him to sleep in her bed. I would recommend looking for free or castoff chairs. Many broken chairs are thrown out. Therefore there would be no reason to destroy a good chair for this project. I would look for a chair with pretty details on the back. Keep in mind that this project also works really fabulous as a doll bed for your little one. 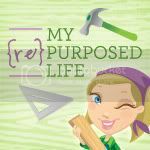 Visit Gail’s blog – My Repurposed Life to learn how to put your own dog bed together (she also has a great FAQ page answering some DIY questions).You can bet I’m going to be taking a closer look at the chairs next time I head to the thrift store. Gail is a do-it-yourselfer who likes to transform items that are heading to the trash into usable items. Along with her Grand-dog Louie and her daughter Jamie, she shares her life with 2 cats, Kitty and Matt and some fish. Thank you for featuring My Repurposed Life’s dog bed! Happy to be here! Thanks for letting me share it Gail! I love the creativity!